The almost hypnotising sparkle of a diamond is a unique feature of this precious stone. There are two factors that contribute to the brilliance of a diamond, and these are brightness and contrast. The brighter the diamond, the more light is returned from its surface back to the observer. There are sometimes cases when the light leaks out, which results in less brilliance. Brilliance is also lost when the light enters and leaves the precious stone in the face-up direction. This phenomenon is caused by diamonds that are either too shallow or too deep to refract light. Due to certain areas acting like mirrors, less light is returned, resulting in less sparkle. What Does A Diamond Need To Sparkle? • The angle of the rays escaping the diamond. These factors add to the scintillation of the diamond, which is the intense sparkling of the diamond, when it is moving. In flood lit rooms black and white sparkles can be seen, whereas the fire can be absent. An ideal diamond has bright flashes across the surface. Another important feature is the polish of the precious stone. Graded in the same manner as symmetry, it can be ideal, excellent, very good, good, fair or poor, according to the GIA grading system. Poor polish can reduce the intensity of the diamond’s brightness. Proportions of the diamond are important for its brilliance, which is heavily influenced by polish as well. Many factors, such as the depth of the pavilion, can cause the light to exit at the wrong angle. Thus, proportions must be precise. Discrepancies from the proportions will result in less light, less brilliance, and less sparkle. However, this information is usually listed in the diamond description given to buyers, and should be included with the precious stone that you plan to purchase. 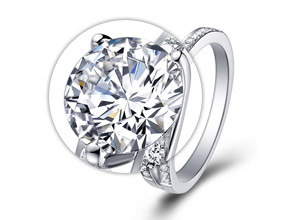 Here at La Vivion we offer you conflict-free, GIA certified diamonds that come in a variety of shapes and polishes. Discover the beauty of these amazing and breathtaking diamonds that can be included in jewellery such as earrings, rings and necklaces. Are you looking for diamond engagement rings? At La Vivion you can customise your own ring – simply choose the precious stone that you like best, then select the setting, and your engagement ring will be shipped to your doorstep. We have a number of stylish vintage and contemporary settings available.